The Wilson family have lived at Lower Gill for over 60 years as dairy and stock rearing farmers. In 1995 we decided to "diversify" into the self catering holiday market. 1. To conserve and enhance the wildlife benefits at Lower Gill by restoring derelict hedgerows in order to encourage thick bushy hedges with grassy strips alongside. 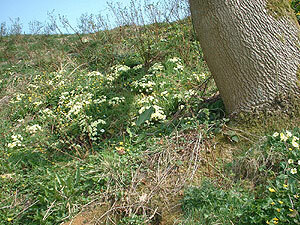 This provides fruit, berries and nuts for overwintering birds and mammals as well as shelter. 2. To manage pastures and hay meadows, so as to encourage ground nesting birds ie. lapwings and curlews. 3. Create two wildlife ponds to increase habitat diversity. 4. Create a new permissive right of way linking existing public rights of way via Flowery Fold Wood which was previously inaccessible. 5. 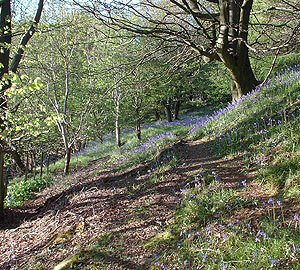 Create shelter belt/wildlife corridor joining Flowery fold Wood, which is classed as Ancient Woodland, through to our most northerly boundary by tree planting. Ten years on restoration and development is now complete with evidence of success in all areas, though management and improvement will continue for the foreseeable future. Spring Bluebells carpeting the woodland floor in Flowery Fold Wood. 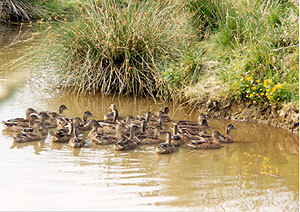 One of our two Wildlife Ponds. A mass of Primroses on a sunny farm bank. 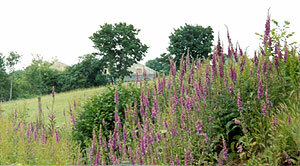 Leaving strips of grass unmown at field edges has encouraged native species such as these Foxgloves.